Lincoln Park Airport offers the best of both worlds: a country setting in a metropolitan area. Both the New York City skyline and the New Jersey Ramapo Mountains are in view from our traffic pattern. We are under the outer shelf of the New York Class B airspace, and our airport is non-towered. This means no long taxis for takeoff, no distracting ATC instructions, and no long waits for clearances. Your flying lessons maximize flight time. However, we are in close proximity to three towered general aviation airports that can be used for training so you can gain the necessary experience. 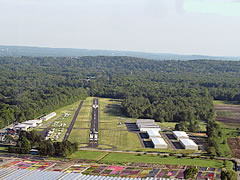 Our airport has one 2,900 ft. runway. When you learn to fly here, you’ll be able to handle most public-use airports in America. Lincoln Park Airport is serviced by two RNAV approaches and can remain operational in all but the worst weather. The airport is also equipped with pilot-controlled runway lighting. Best of all, Lincoln Park is a friendly, comfortable airport. Pilots and flying enthusiasts watch takeoffs and landings from the restaurant patio. Kids can walk right up to the airport fence to watch owners tinker with their planes. In short, at Lincoln Park Airport you can relax while you learn to fly.